The High Altar, Sunday, July 8, 2018 Photo by Sr. Monica Clare, C.S.J.B. Dr. Hurd plays the first part of the service from the console in the chancel during the summer months. The good news is that the General Convention opted not to begin the process of replacing the Prayer Book. You can read the adopted resolution here. In addition to the General Convention's Standing Commission on Liturgy and Music, there is now to be a "Task Force on Liturgical and Prayer Book Revision"—and the enabling resolution even gives an abbreviation for it, "TFLPBR." New rites are going to be written. There's going to be a lot of experimentation. The efforts to undermine the use of the Prayer Book and the Prayer Book's explicit Trinitarian theology have been underway for some time now. Our common prayer will be less common than it is now. I was unable to attend the 2018 priests' conference of the diocese of New York, but I was there in 2016. Bishop Andrew Dietsche addressed the question of the canonical and Prayer Book position of the church only offering communion to the baptized. He estimated that about seventy percent of our congregations were inviting the unbaptized to receive communion. He also said that the priests of our diocese need not worry about ecclesiastical discipline on this issue. So, the resolution authorizing the TFLPBR begins with something that is already out of date for our diocese: "Resolved, That this church continue to engage the deep Baptismal and Eucharistic theology and practice of the 1979 Prayer Book." My impression is that the greater part of the Episcopal Church has already become, to use a title of an article by liturgical scholar the Reverend Dr. Lizette Larson-Miller, a church with a "Baptismal Ecclesiology without Baptism" (L. Larson-Miller and W. Knowles, eds., Drenched in Grace , 80-92). I know of no other Christian denomination apart from the United Methodist Church in the United States that practices what United Methodists call "open communion." (By the way, Mother Larson-Miller's article on this subject is excellent and to the point.) That said, the most worrisome line in the resolution may be this: "Resolved, That our liturgical revision utilize inclusive and expansive language and imagery for humanity and divinity." I am encouraged by what the Reverend Matthew Hoxsie Mead, rector of the Parish of Christ the Redeemer, Pelham, who has been one of our diocese's delegates to the General Convention, has written about the working of convention and the resolution on the future of our worship. You can read his post here. I'm very thankful he was part of the delegation of the diocese of New York. The lessons are read by a member of the congregation. YOUR PRAYERS ARE ASKED FOR Joban, Stephen, Eugenia, Ptolemy, Sheila, Eloise, Angie, Maxine, Anita, George, Alex, Dora, Marilouise, Dennis, Bob, Abe, Randy, Burt, Mike, Kyle, Greta, Karen, Melissa, May, Heidi, Ridhima, Marissa, Takeem, David, and Sandy; for Horace, Gaylord, Louis, and Edgar, priests; and for all the benefactors and friends of this parish. GRANT THEM PEACE. . . July 15: 1882 Charles Stone Timson; 1885 Anita Taylor Mills; 1912 Marie Tompkins Spelman; 1979 Curtis Henry Waite; 1986 Peter A. J. McGrane; 1987 Allen C. Satterfield; 1989 Robert Fox Davis. THIS WEEK AT SAINT MARY'S . 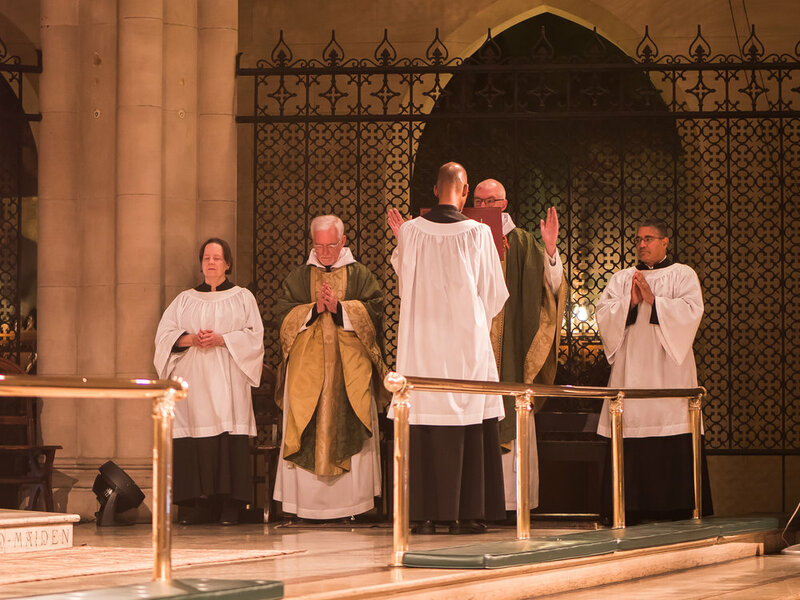 . . On Friday, July 13, the Seventy-ninth General Convention of the Episcopal Church finishes its work in Austin, Texas. On Tuesday, July 17, the church will commemorate the life and witness of William White, bishop of Pennsylvania, d. 1836. Bishop White "was the chief architect of the Constitution of the American Episcopal Church and the wise overseer of its life during the first generation of its history. He was the presiding bishop at [the Church's] organizing General Convention in 1789 and again from 1795 until his death" (LFF 2000, 290). Mass will be offered at 12:10 PM . . . Wednesday, July 18, Sung Mass 12:10 PM . . . Thursday, July 19, Mass and Healing Service 12:10 PM . . . Friday, July 20, 6:30 PM, Centering Prayer Group, Atrium, Parish Hall, Second Floor. Before Mass bread, wine, and water are placed at the Shrine of the Sacred Heart. Just before the procession of the gifts, they are brought to the ushers' table. AROUND THE PARISH . . . On Tuesday, July 17, 2018, 7:00-8:00 PM, Saint Mary's organist and music director David Hurd will play a recital in the Summer Organ Series of Riverside Church. See the church's website for more information. Riverside Church is located at 490 Riverside Drive at 120th Street, just west of Broadway . . . Pledge to keep up with your pledge! During the summer months we sometimes experience cash-flow problems as many friends and members of the parish are away, taking much-needed vacations. We urge all those who made pledges for 2018 to stay current with their pledge payments. We are grateful to all those who continue to support the mission and witness of this parish . . . News from the Episcopal Church's triennial General Convention taking place in Austin, Texas, is available on the website of the Episcopal News Service . . . Sister Laura Katharine, C.S.J.B., returns to the parish from vacation on Friday, July 13 . . . Sister Monica Clare, C.S.J.B., will be on vacation from Saturday, July 14, through Friday, August 3 . . . Father Jim Pace will be on vacation and away from the parish from Thursday, July 19, through Sunday, July 29 . . . Attendance: Last Sunday 179. OUTREACH AT SAINT MARY'S . . . There will not be a Drop-in Day during the month of August. During that time, The Homeless Ministry Team will be planning for the 2018-19 season, saying goodbye to Sister Monica Clare, and making preparations for the arrival of Brother Damien and Brother Thomas. Donations and volunteers are needed for our next Drop-in Day on Wednesday, September 26, and for the many requests for assistance between Drop-in Days. We are in particular need of basic items such as the following: packs of new underwear in various sizes for both men and women; slacks for both men and women, including jeans, chinos, khakis, etc. ; packs of new socks, white and black; rainwear; knapsacks; and toiletry articles . . . Please contact Sister Monica Clare if you would like to volunteer for this important ministry or if you would like to make a donation . . . We continue to receive nonperishable food items for our outreach partner, Saint Clement's Food Pantry. Please place those items in the basket near the ushers' table at the Forty-sixth Street entrance to the church. ABOUT THE MUSIC . . . Ruth Cunningham, soprano, will be the cantor at the Solemn Mass on Sunday morning. During the ministration of Communion she will sing O viridissima virga by Hildegard of Bingen (1098-1179) and will accompany herself on a harp of medieval design. Musicologist Timothy Dickey writes, "Hildegard's poem O viridissima virga exudes images comparing greening nature, and its healing effects on humanity, to Mary. Hildegard's musical form is somewhat vague, but apparently strophic: successive verses all begin with melodic phrases which somehow emphasize the modal tonic pitch of G (Hypomixolydian) and the third above it. The chant proceeds in a neumatic fashion (with relatively few melismas) and remains (for her) rather largely restrained within the plagal modal octave. Yet this musically restrained character clearly maintains its close modal focus to the listeners' ears and allows her luminous text to blossom above the ever-present tonic foundation." Ms. Cunningham will also be improvising the Alleluia and Communion propers of the Mass. LOOKING AHEAD . . . Monday, July 23, Saint Mary Magdalene (transferred). Mass will be offered at 12:10 PM and 6:20 PM . . . Wednesday, July 25, Saint James the Apostle. Mass will be offered at 12:10 PM and 6:20 PM . . . Monday, August 6, The Transfiguration of Our Lord Jesus Christ . . . Tuesday, August 14, The Eve of the Assumption of the Blessed Virgin Mary . . . Wednesday, August 15, The Assumption of the Blessed Virgin Mary . . . Friday, August 24, Saint Bartholomew the Apostle . . . Monday, September 3, Labor Day. TIMES SQUARE AND BEYOND . . . Times Square, Broadway, between Forty-sixth and Forty-seventh Streets, July 11-September 5, 2018, "Wake, commissioned by Times Square Arts, is a twenty-four-foot-tall installation [by American conceptual artist Mel Chin] that evokes the hull of a shipwreck crossed with the skeletal remains of a marine mammal. The structure is linked with a carved, twenty-one-foot tall animatronic female sculpture, accurately derived from a figurehead of the opera star Jenny Lind that was once mounted on the nineteenth-century clipper ship, the USS Nightingale. The artwork calls forth both the city's triumphs and the complicated layers of its past. New York City has become a center of trade, commerce, finance, entertainment, and tourism, but also has a complex history that included the shipping (by the USS Nightingale, among others) of guns and slaves, that augmented this burgeoning city's economy. The expanding past economies are prologue to our current environmental dilemma. The physical presence of Wake will serve as an entry point into Unmoored, an ambitious twenty-first-century mixed-reality public art project that will be a draw for all ages and backgrounds" . . . On the High Line, West Street at Sixteenth Street, Saturday, July 14, 2018, 10:00 AM-4:00 PM, the High Line Honey Harvest Event. From the park's website, "A free community event on the High Line. The Chelsea Market Passage [the stretch of the High Line park that cuts through the western side of the Chelsea Market] will be buzzing [sic] with activity, including an educational presentation by Andrew's Honey, honey-tasting stations, and walls of indigenous flowers, just to name a few. High Line Honey is a year-long initiative to highlight the vital role that bees play in sustaining the planet's food supply and ecosystems. The initiative will produce between 100 to 150 pounds of honey from rooftop beehives in the Chelsea neighborhood. The harvested honey will be sold at the High Line Honey Harvest Event, with 100% of the proceeds from honey sales benefitting the horticulture and sustainable maintenance of the park."